In our blade range we also offer friction saw blades for cutting pipes and structural shapes. We produce friction saw blades for stationary or flying cutting machines, to cut pipes and profiles in carbon steel, such as St 37 or St 52 with hardness between 300 and 600 N/mm². Julia Utensili manufactures friction saw blades in two different materials: Chromium Vanadium Steel (80CrV2 or 1.2235) and Tungsten–Molybdenum Steel (73 WCrMoV2 or 1.2604). We offer a comprehensive range of dimensions that will fit all the major machines using friction technology, such as: Abbey, Etna, Dreistern, Mannesmann, Oto-Mills, MTM, Vai Seuthe, TRM, and Trennjäger. 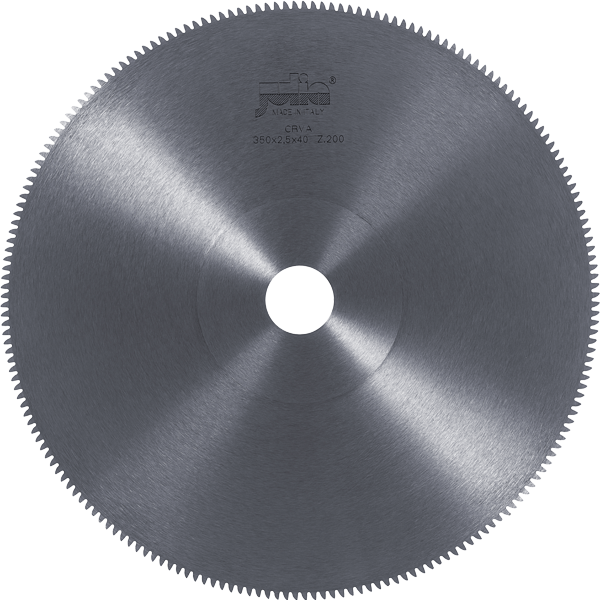 The friction saw blades, contrary to the cut off circular blades for slow sawing machines, work at a higher speed rate, heating up the cutting zone, and facilitating the cutting operation as the material reaches a plastic state. The heat treatment gives our friction saw blades a hardness of between 42 and 46 Hrc depending on the application and the material to be cut. Because of the high temperatures, to maintain the saw blade stability it’s necessary to ensure the tool is the correct dimension in order to avoid blade deformation due to heating towards the edge. Our engineers recommend keeping the right ratio between diameter and blade thickness. As for the number of teeth and the pitch, we normally suggest pitch 5 or 6 mm for thin wall pipes and 7 or 8 pitch for bigger wall pipes. The plastic conditions of the material to cut influence the friction saw blades parameters. Our technicians can suggest the right cutting speed and feed for the different applications.